The mass death of marine creatures can be a stressful event for both humans and these sea creatures. Population drops for any species is a cause for concern because they threaten the survival of the species as well as those that depend on them for food and resources. Following the recent storms and freezing weather that hit the UK, many sea creatures died as a result. Large numbers of lobsters, crabs, mussels, and starfish were washed up on the North Sea Coast in the UK. Thousands of dead marine life was found along the eastern side of the UK in places like Yorkshire, Kent, and Norfolk. According to Bex Lynam, from the Yorkshire Wildlife Trust, many marine animals because vulnerable to this weather system because sea temperatures dropped by 3C. This meant that much marine life had to seek safety and become less active. As the seas became rough and cold, they were left weakened and became easily dislodged from their shelters. The rough seas created strong waves that forced them away and washed them ashore, which led to their deaths. The casualty was limited to invertebrates and small fish because larger animals were more mobile and strong enough to resist the temperature drop and rough waves. Dolphins and similar animals were able to survive the storm. 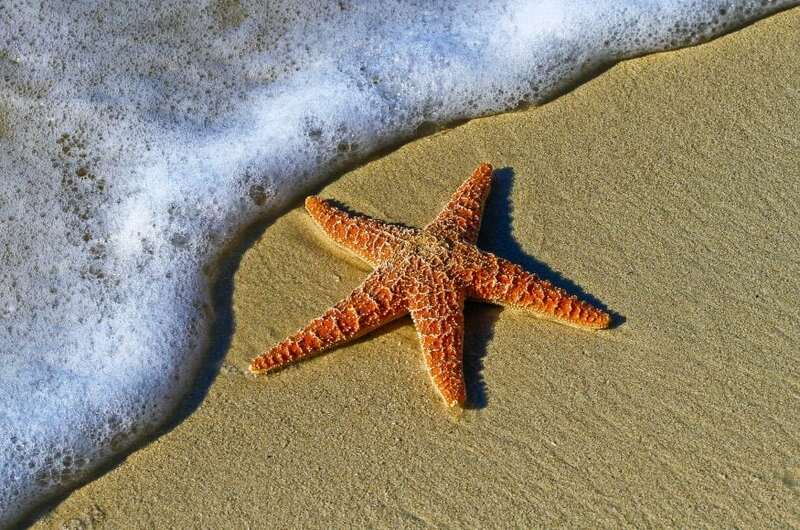 While the deaths were large in number, not all sea creatures were dead when they were washed up. Teams from the Yorkshire Wildlife Trust worked with local fisherman to gather up any surviving lobsters so that they could eventually be returned to the seas when the weather calmed. Alongside the mass deaths that caused population drops, this mass death also affected the fisherman because the area had many programs aimed towards sustainable fisheries and served as a reproductive stock to promote population growth. While these natural disasters cannot be prevented, Dr. Lisssa Batey, senior living seas officer at the Wildlife Trusts, believes that we can mitigate the consequences of these storms. By creating more protected areas that are large enough and close to other marine life, these sea creatures can have a more stable environment that is capable of resisting storms like these. Current Marine Conservation Zones are considered inadequate because they give the illusion of protection while offering none. They require better planning and management, according to Callum Roberts, a professor at the University of York. This mass death was caused by a powerful weather system that many invertebrates and small fish were unprepared for. Unfortunately, we have been seeing a rise in natural disasters like this and many others. 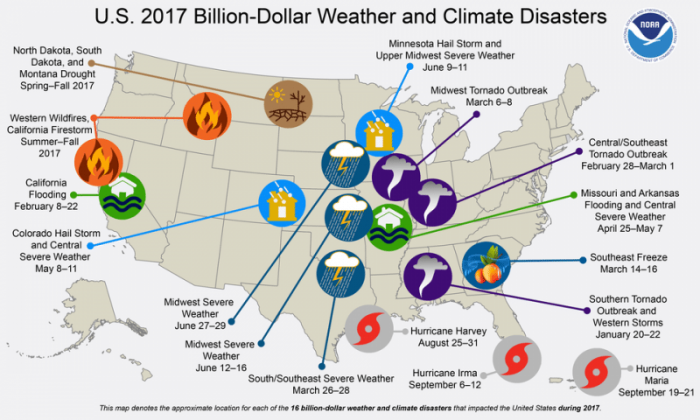 In the United States, we saw about $306 billion worth of damage caused by natural disasters in 2017 such as forest fires, like those that plagued California, and hurricanes. This represents the most costly year on record beating out 2005, which saw $216 billion in damages. While the U.S. is not seeing more hurricanes, it is experiencing hurricanes that are more powerful than previously seen. The increase in natural disasters is seen as a complicated factor. One general consensus many scientists consider is that this is not due to climate change and global warming. According to the National Oceanic and Atmospheric Administration (NOAA), climate change will eventually impact natural disasters and be the root of them in the latter part of the 21st century. Many predictive models are showing an increase in storms and intensity of storm systems as a result of climate change in the future. Right now, the causes are due to things like water vapor concentration in the air, air temperature, sea surface temperature, and other related factors. The other factor is people themselves. As more people move into areas that are prone to natural events, we see them as natural disasters because of the damage they due to humans. More people are put in harm’s way and that is recorded and becomes apart of the numbers when we look at disasters. Alongside the mass death of marine life caused by natural disasters, we are seeing an increase in mass deaths overall that threatens the existence of many marine animals. Samuel Fay, from Yale University, worked with researchers from across the United States and found that as mass deaths of animals, particularly marine animals, increased so did things like algae blooms and anthropogenic disturbances. As climate change increases the oceans natural temperature, it promotes extensive algae growth, which leads to the toxic blooms that kill off many marine animals. Warmer temperatures also increase the areas that disease can live while restricting and changing the areas that much marine life can live in. This displacement creates additional stress on populations that cannot survive it. We are also seeing increases in plastics being put into the oceans, and these become apart of much marine life. The result is lowered reproduction, increased deformities, and eventually mass deaths. These mass deaths themselves also causes problems because as large quantities of biological things degrade and rot, it causes an influx of predators, bacteria, and contaminate the surrounding environment. These can all lead to a vacuum that allows invasive species to enter and further disrupt the local population of animals. As natural disasters continue and are expected to rise with the future effects of climate change, mass deaths will continue to increase and impact the marine environment. Coupled with overfishing that is driven by human demand for more food products, these massive losses of marine life will drastically alter the oceans and seas as more invasive species are allowed to succeed and many local species cannot compete and die out. It becomes increasingly important to establish protected zones to ensure that these marine lives can continue to thrive as well as provide us with the food resources we need and want. We also need to implement more sustainable developments and ways of harvesting fish like those being implemented by farmers working with the Yorkshire Wildlife Trust.